My darling hubby Alex (see, trying to wean you off “hubby”) is gone for a whole week on business. And without him here I feel like I revert back to all my “bachelor” habits. Mostly, I have overwhelming urges to have a bag of chips for dinner. It’s so easy, there’s no one here to see, no one will know... are some of my best excuses. It’s so good while it lasts, but almost invariably results in feelings of guilt. Being someone who works hard to maintain her weight, I want to share with you some of the best advice I’ve read in a while about this type of situation. So you ate chips... that’s FINE. It’s one bag of chips. Get out of the mindset that you’ve now ruined your day, week, diet, and get right back on the horse. Don’t let one slip be your excuse to eat terrible things all day/week/life. Therein lies the real problem. Keeping with the St. Patty’s day theme this salad is all shades of green. Also alliteration. That part was not on purpose, but I am proud. Kale is my favourite right now. Spend some quality time with your kale and massage it a little with some nice (olive) oil to make sure it is not tough. 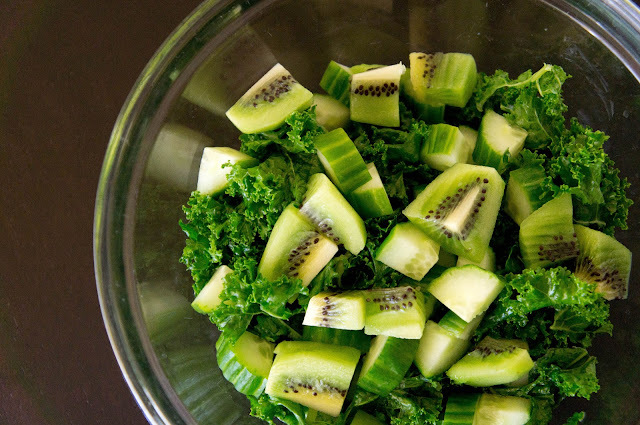 This step is totally worth it (not just for the kale...). Let’s pretend I didn’t just get intimate with my salad and continue. 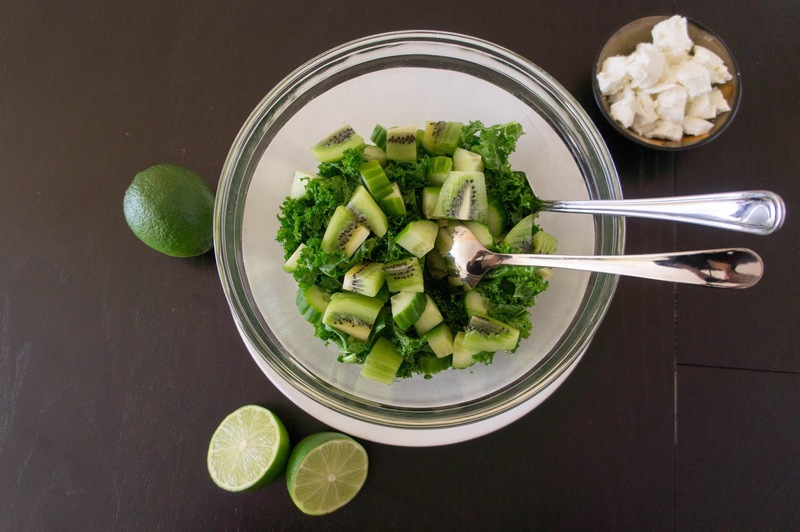 Cucumber is crunchy and refreshing, kiwi adds some sweetness, and goat cheese is the tang. 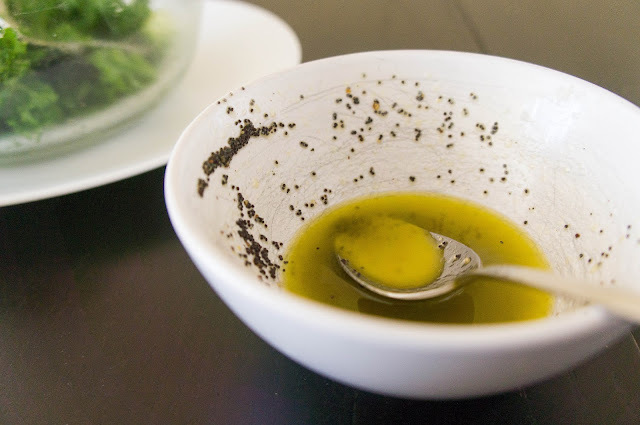 The lime and poppy seed vinaigrette adds just the right amount of acidity to balance it all. 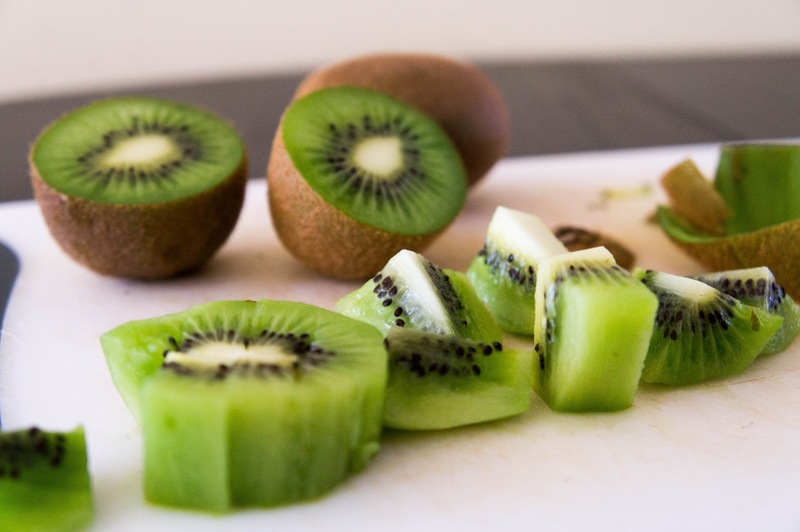 The poppy seeds were really just to mimic the look of the kiwi seeds. Super cool food simile. 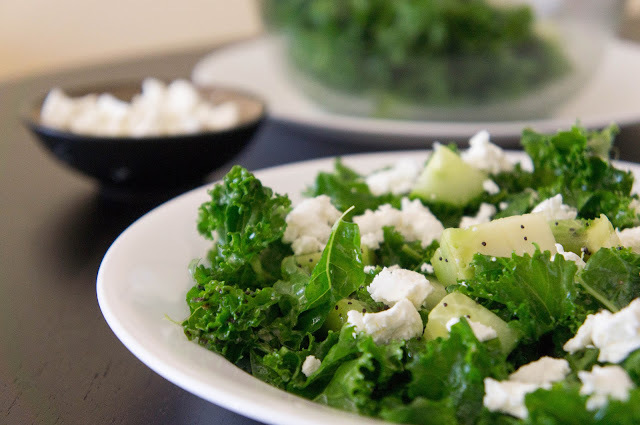 This salad is an homage to green and great for assuaging feelings of guilt. We are back on the horse and feeling awesome! Pour a tiny bit of olive oil onto kale leaves and massage with your fingers until they wilt a tiny bit and turn a slightly deeper shade of green. Whisk lime juice with olive oil, poppy seeds, salt, and pepper. It should emulsify and become slightly thicker. Pour as much vinaigrette as you like onto the salad and toss to coat. Crumble on goat cheese. For more greenspiration this St. Patty’s, check out my green butter.